Páginas de la obra de Shimei Heibon 平凡 (1907). ↑ a b c Sōseki Natsume, Marvin Marcus (2009). Reflections in a glass door: memory and melancholy in the personal writings of Natsume Sōseki (en inglés). University of Hawaii Press. p. 267. ISBN 9780824833060. ↑ Masao Miyoshi (1974). Accomplices of silence: the modern Japanese novel (en inglés). University of California Press. p. 194. ISBN 9780520025400. ↑ a b Nanette Twine (1991). 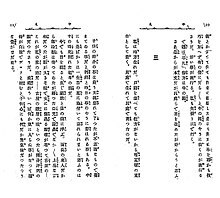 Language and the modern state: the reform of written Japanese (en inglés). ¡: Taylor & Francis. p. 329. ISBN 9780415009904. ↑ a b Dámaso López García (1996). Teorías de la traducción: antología de textos. Cuenca, España: Servicio de Publicaciones de la Universidad de Castilla-La Mancha. p. 623. ISBN 84-88255-88-8. ↑ a b c Mikiso Hane (2007). Breve historia de Japón. Madrid, España: Alianza Editorial. p. 362. ISBN 978-84-206-5566-6. ↑ Hisaaki Yamanouchi (1980). The Search for Authenticity in Modern Japanese Literature (en inglés). Cambridge University press. ISBN 0 521 29974 8. ↑ a b Susan Tsang y Edward Hendricks (2008). Discover Singapore: the city's history & culture redefined (en inglés). Marshall Cavendish. p. 208. ISBN 9789812613653. ↑ John Scott Miller (2009). Historical dictionary of modern Japanese literature and theater (en inglés). Scarecrow Press. p. 191. ISBN 9780810858107.